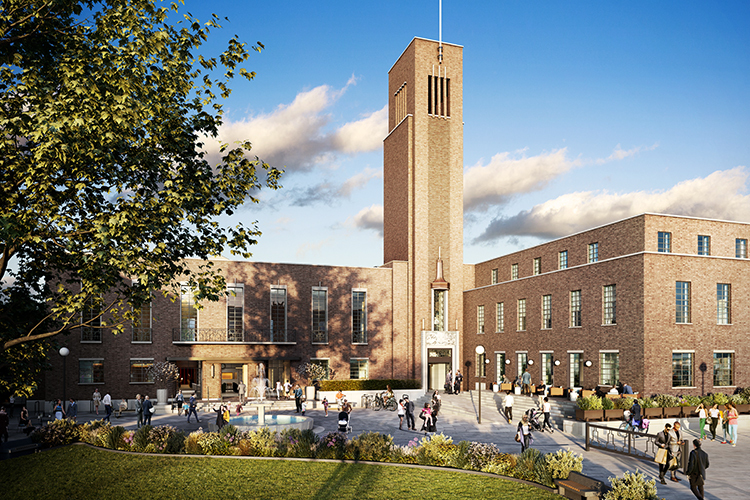 We’ve heard a number of ‘what’s up?’ queries about the Hornsey Town Hall development in recent weeks, so we thought we’d post an update of things we know, or at least things we think we know. In brief, the £140m project and £30m Town Hall refurb remain on track, albeit a few months delayed from the original timetable. For a summary of contract details see download available below. Previous blogs on HTH can be found here. Any questions, please do add them in the comments box below this post – but don’t treat anything here as gospel. The developer also has a devoted website, which carries occasional news updates. Firstly, as people may have seen elsewhere, the HTH Arts Centre people (Time+Space Co) are about to raise the curtain on some market research with a series of themed workshop sessions, delivered by well-respected consultants, the Audience Agency. The aims of the exercise are: to engage the community; understand the audience and their desires; map the arts and cultural landscape; and encourage creative collaboration. If you’re interested and haven’t already signed up for a session, please do – they need to know what tickles the Crouch End fancy. For more details click here. For a CENF view of the consultation, we blogged earlier. The developers, Far East Consortium (FEC), have spent much of the last few months minimising risk to the project via extensive investigations into the integrity of the building, and have lately gone out to tender for the construction partner. We believe they’re at the mid-term tender review stage, and expect to appoint in January. Various design modifications have been made over the course of the last year, so a submission to the Local Planning Authority (likely in the form of a section 73 application, plus Listed Building Consent) should appear in the coming weeks. Amendments include new arrangements for the TH lifts, re-modeling of the lower ground floor ancillary spaces, changes to the Supper Room, reinstating the box office, new workspace/office spaces, redesign of the first floor cinema/studio space, revisions to the design of the hotel guestrooms, possible balcony spaces behind the parapet for the flats above the eastern annexe building, etc. 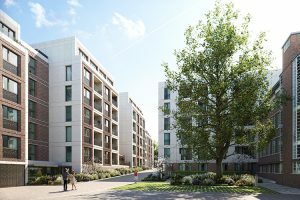 Haringey Planning will also be expecting FEC to begin discharging the long list of planning conditions. Once the contractor is appointed, the timetable is governed by clauses in the Development Agreement (see below). The specifics of demolition, closure and construction across the site won’t be known until the contractor is on board. May 2018: FEC take possession & commence off-plan sales of residential flats. July 2018: Time+Space Co assume operation of Arts Centre. Q3/Q4 2018: Pre-commencement surveys / FEC go out to tender for contractor. Q2 2019 to Q3/Q4 2021: Build out (FEC have agreed a 2 year 6 month ‘Construction Period’ with Practical Completion stated as 675 working days from commencement of mobilisation period). FEC don’t expect any occupation of flats until Q1 2021, or hotel rooms until Q2/3 2021. The affordable flats will be in the final stage of the build, we don’t know who will take delivery. We expect the rebuild of the Town Hall Square and the green will be late in the project. Negotiations are ongoing for food & beverage operators. In the interim, certain spaces at the front of HTH may be kept active as the works progress. 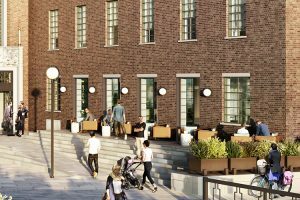 These include the foyer, the Ply Gallery space, the café (which looks as if it will relaunch soon), and the ground floor of the west wing which has recently re-emerged as an meanwhile-use shared workspace under the title “Hornsey Works“. 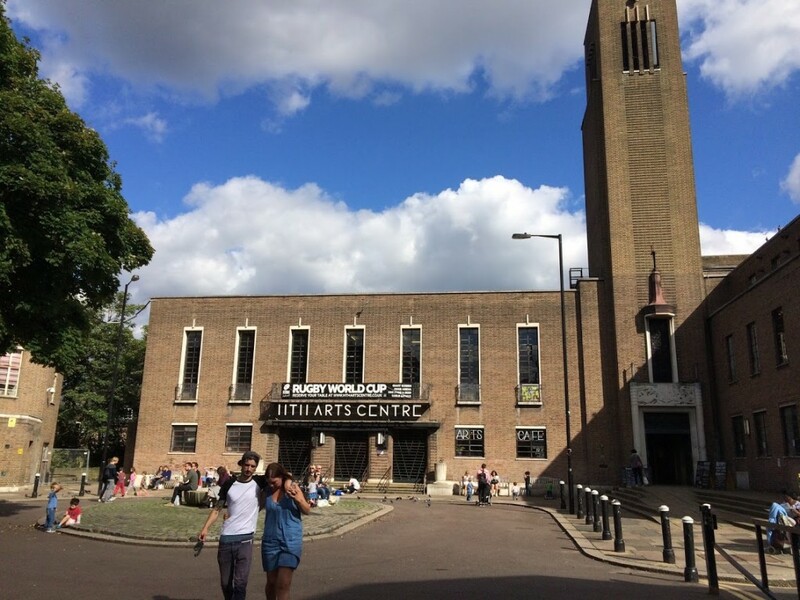 In addition to the Arts Centre consultation, the contractors/FEC are required to set out a community engagement strategy, including liaising with neighbours over construction issues, and, we hope, producing a more wide ranging series of newsletters and reports about the project. Detailed updates on the progress of the restoration of the Town Hall would be particularly welcome, and of widespread local interest. We’ll publish further details when things are firmed up. A few responses to recent questions…. but do keep your eyes on the prize Crouch End – with a full rescue and restoration at long last imminent after years of neglect, there’s much to look forward to. 1. Will FEC deliver on their promises? Well, we see no reason to believe they won’t, everything seems to be progressing as expected and their commitment to the project and willingness to share information is positive. Having said that, should the economic climate worsen and revenues tighten, you’d expect a commercial company to be a rational actor and look for savings. Fingers crossed. It is important to note that the entire purpose of the Development Agreement, made between Haringey and FEC, is to safeguard the delivery of the project on time and as specified (we’d like to report that Haringey are taking a close interest, but aside from the planning dept., who knows). 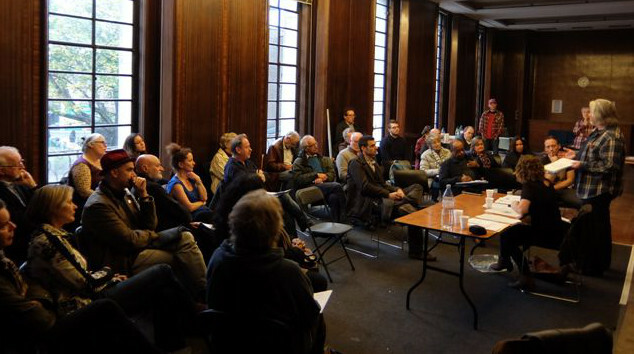 Meetings between the developers and Historic England are ongoing, alas behind closed doors. 2. Are they still building a hotel? Yep. When we last heard the 67 room hotel will be opening under the brand “Dorsett Residences”. This will be a take on an aparthotel aimed at slightly longer stays with each room fitted with a kitchenette. A hotelier’s interpretation of airbnb studios perhaps. The Arts Centre and restaurants are positioned as part of the wider hotel offer. 3. Will FEC stick around after the project is completed? They clearly intend to, and have said so on numerous occasions – though pretty obviously they would revisit such a commitment if the operation failed to hit the expected return over the years ahead. Please note, although contractually FEC are deliberately tied in to the development period, there are no subsequent restrictions on the sale of the TH to new owners as soon as Practical Completion is attained. Additionally, an arts centre and hotel are not identified in the lease, so in future the TH can be sold to anyone, for any use, be it hotel or supermarket, office, casino or mosque. All the more reason that the current project is supported? Heaven knows what we’d get if it failed. 4. Will we continue to see community uses and public access? Yes, it’s a condition attached to the lease. Even if/as new owners emerge in years to come, they will be expected to comply with this. However, don’t get ‘community access’ mixed up with its current incarnation as an arts centre. You could run a completely different operation and still fulfil the obligation. 5. Can the Council get it back again? The terms of the disposal were pretty definite. Haringey remain as freeholders but will play no role at all for the 130 years of the lease. If FEC went bust or completely failed to deliver the project, the Council would possibly regain the site, but otherwise no. A completed, restored Town Hall is valued at £30 million. The chances that Haringey will decide to buy back a building for which they have no use at such a sum – and in Crouch End – are precisely zero. 6. Do FEC have to restore the TH before building the flats? One of the most shocking and outrageous things to the plans, in my opinion, is the massive reduction to the green in front of the Town Hall, involving the digging up and moving of the tree and plaque, just behind the W7 bus stop. There will be much less space for people to sit in the grassy area. Apparently the refurbed HTH cafe is due to open tomorrow – go visit..